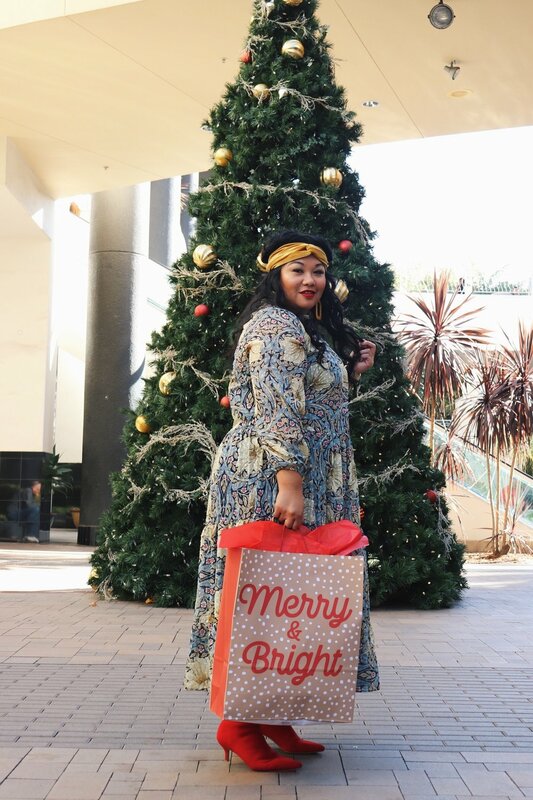 I am ecstatic to present to you my second Holiday Dress for Less Week lookbook here at We Are Bebot! In the next couple of days, I will share with you outfit ideas for all the parties December has to offer. More importantly, the pieces I’ll be wearing are all great deals and under a $100. My goal this year was to mix and match what I already have in my own closet and hopefully this series will inspire you to do the same so you can save time from the crazy congested mall stress and more time for your loved ones and yourself! 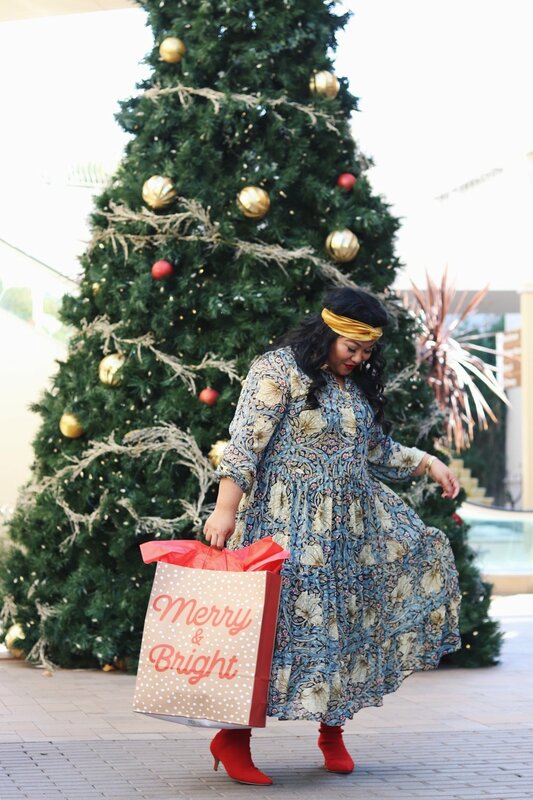 So please join me in the next few days as I share with you holiday dressing on a budget. First up- this easy and comfy outfit perfect for celebrating with the in-laws, the crazy cousins, Mom and Dad, or friends turned family. I am sure you have a maxi dress in your closet. With a few festive accessories, your outfit will look Christmas-ready and merry and bright. See how I did that? I love, love, loooovvee I’m With The Band’s hair accessories and their velvet turbans are the perfect #treatyoself reward that is a perfect topper for holiday fits. These sock boots are a year old now and in my opinion, a closet’s staple that can be used time and time again. As for this gorgeous maxi dress, I have been eyeing this piece as soon as the William Morris & Co. x H&M collab dropped at the beginning of Fall. Sometimes, I can be a disciplined shopper so I waited patiently and was stoked that I found this piece on the clearance rack at H&M that went from $50 to $23. Merry Christmas to me! Okay so allow me to share something that was a blessing to me from church last Sunday. In Christian traditions, Advent (observed starting December 1) is a time of expectant waiting and preparation for both the celebration of the Nativity of Jesus at Christmas and the return of Jesus at the Second Coming. The word advent means a time of waiting. Long sermon short (ha), Advent emboldens us to enjoy the wait for Christmas. We as a society have become a fast-paced, I need it now, instant ramen, microwavable type of people, and I am guilty for getting caught up in the busyness of the season then complain how fast Christmas comes and go. This season, I am encouraged to take and savor each day as Christmas comes closer. No complaining how fast it is and deliberately staying home on weeknights to stare at the Christmas tree while I count my blessings and thank the One who is the Giver of all. I wish you the same. I wish you a slow-cooker kinda’ Christmas season and wish you joy in the wait for the magic of December 25th.